I really love homes with color on the walls. I am always trying to find ways to add color because my hubs isn’t thrilled with painting. 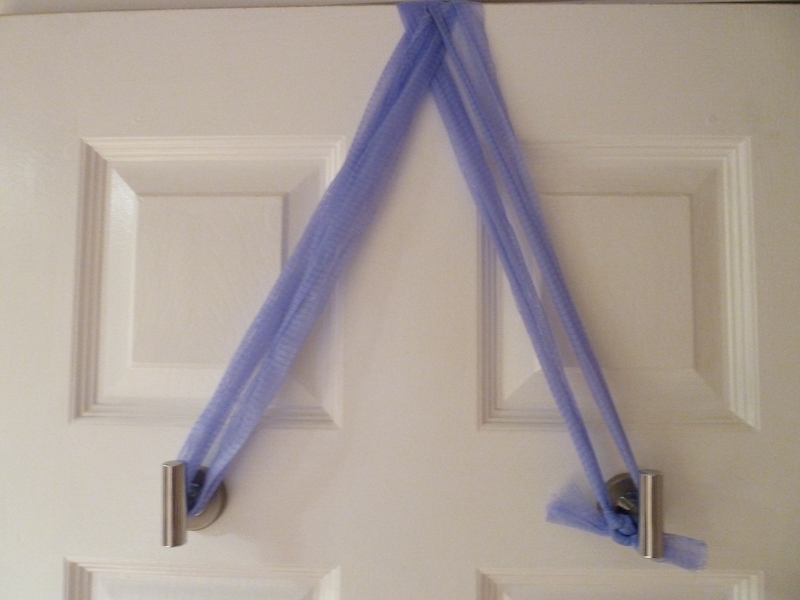 So I thought I could add some color with a wreath on the bathroom door. You might think this is an odd place for a wreath but I got to thinking after a party how many people asked me where our bathroom was. I think people were just being polite to ask because our house is not big and actually all on one level. So instead of giving weird directions of go straight then slightly right and it on your left, I could say just look for the bathroom wreath. 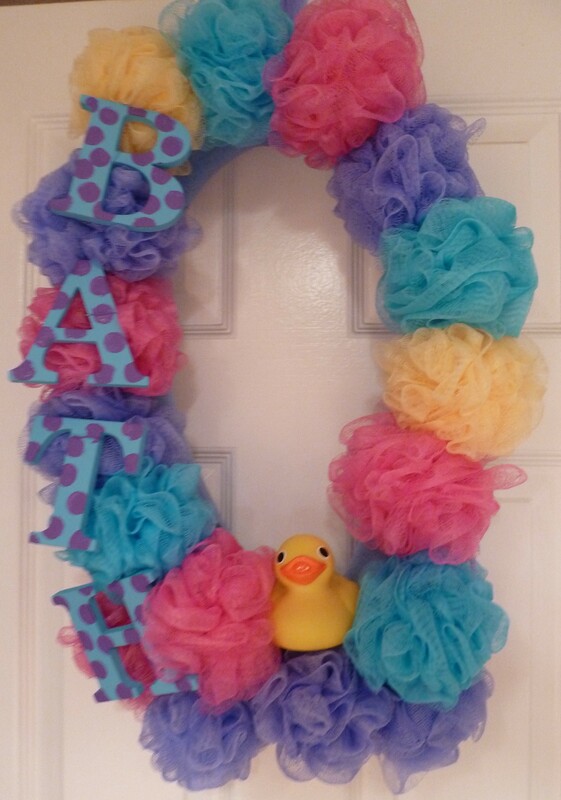 So really it’s more of a sign and just fun to have a wreath on your bathroom door! Here is the tutorial. Again I used a pool noodle for the wreath. 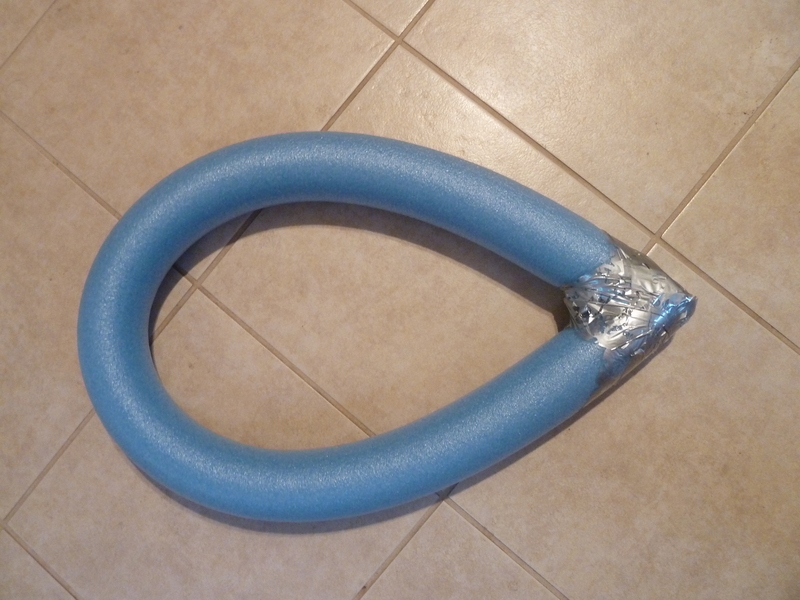 So bend it into any shape you want. I chose a somewhat oval shape. Next I painted my letters B-A-T-H a light blue color. Now here is where your wreath might differ. 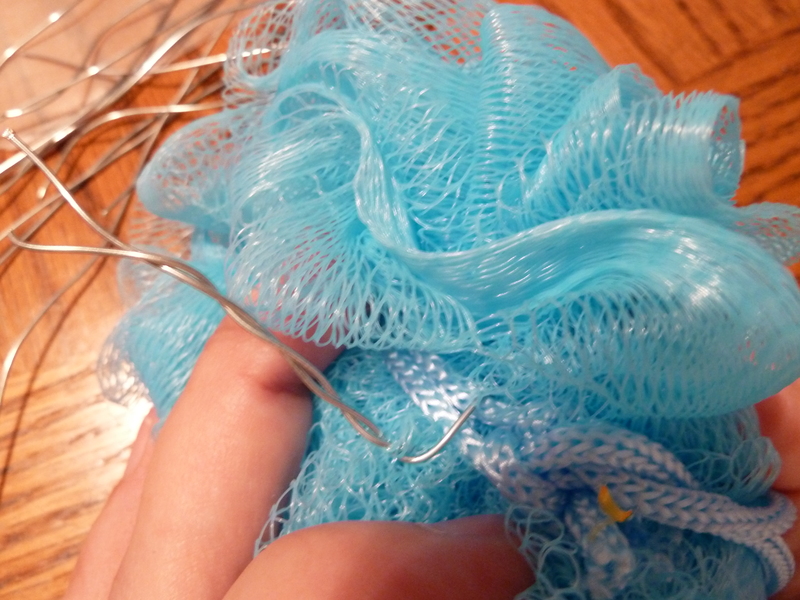 I cut 17 five inch strips of my floral wire and wrapped it through the loofa string and then poked it into the noodle. This isn’t the sturdiest way to attach the loofas. 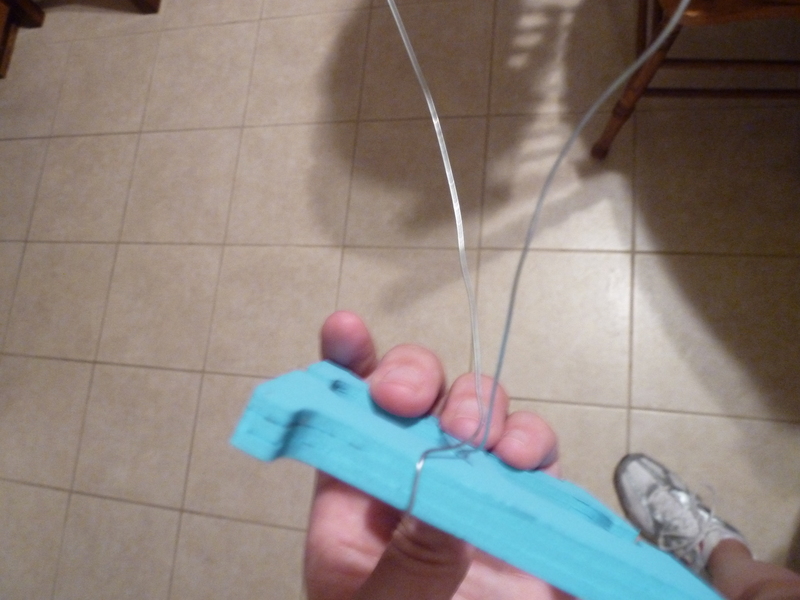 If I were to do this again I would cut the wire long enough to wrap it around my noodle and tie in the back. Also only use 17 because you are going to take one a part and hang the finished wreath with it. Just play with the placement until you are happy with the result. Next cut strips of your wire and attach your letters to the wreath. 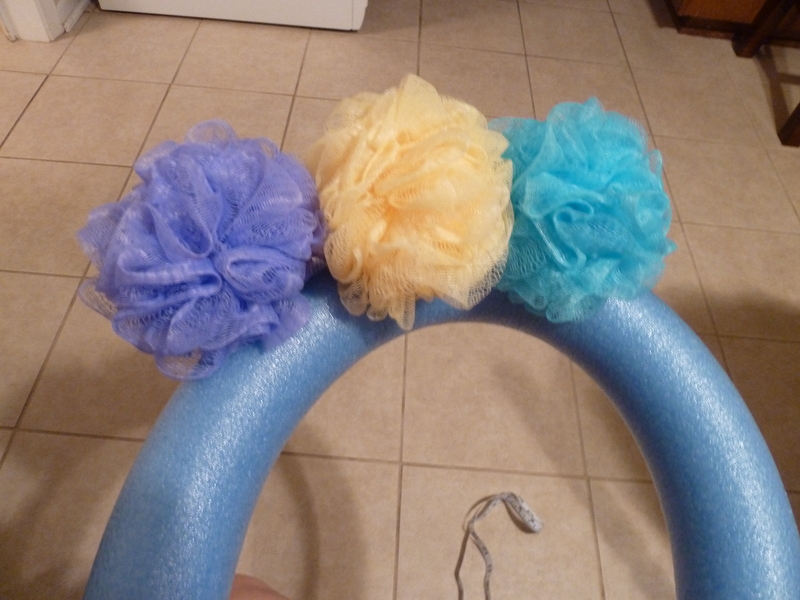 You can use the loofas to cover up the wire. Now I am the queen of rigging things up so to hang this wreath I totally did that. 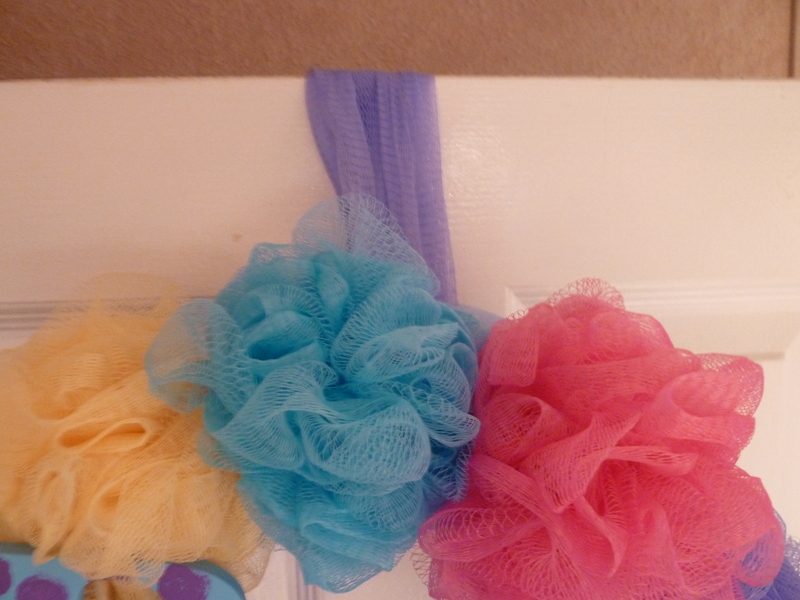 I took a part one of the loofas and wrapped it through the wreath and over the back of the door to my two towel hooks in the back. Now I realized that not everyone has this set up so I think a Command Adhesive Hook or a regular ole’ wreath hanger will work. My rubber duckie is just sitting on top of the loofas but you could also wire this guy in there too. I hung my wreath with solid blue letters and then decided to add the polka dots on the letter while it was hanging up. Just use a small circular sponge to make the dots. You could do this step when painting your letters. It adds a punch of color for our bathroom. The baby loves looking at all the colors while bathing. Have fun with your wreaths. 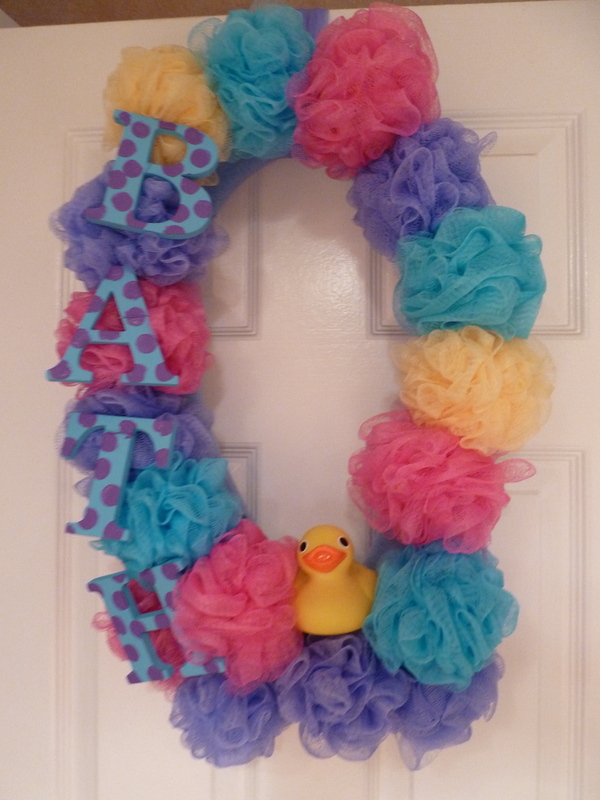 Posted in Tutorials, Wreath Week and tagged bath wreath, colorful wreath, duck wreath, loofa wreath. Bookmark the permalink.